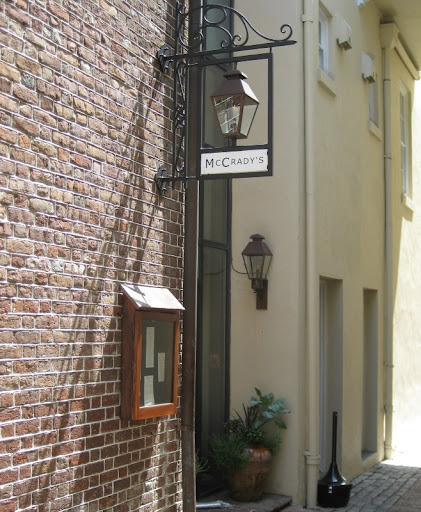 I got turned on to McCrady's in Charleston from positive reviews on chowhound, so we stopped in one night for their tasting menu. During the summer they are doing a shorter tasting menu than their normal one. Currently it features tomatoes from their garden - $50 for four courses. Served nicely chilled. Good tomato and crab flavor. Attractive dish. The single, well seasoned tomato slice was very good, as were the berries. I didn't feel that they complemented each other particularly well, though, and would rather have had another slice of tomato instead of the berries. I'm picky about sweet things in a salad, though - Sherry liked the pairing better. Described as the chef's take on a BLT, this was the best dish of the evening. The Halibut was perfectly cooked and the tomato sauce had great flavor. The fish was sitting on a bed of cooked down lettuce that was a really nice addition. The bacon came in two places - the addition of a foam (it's not molecular gastronomy until someone adds some bacon foam...) and a very tasty sliver of crispy toast that had been infused with smoky bacon fat. The pork was small loin slices that were perfectly cooked (sous-vide, maybe?). It had the flavor of loin, but a nice soft texture more like tenderloin. It was topped with celeriac "noodles" that I didn't think worked at all. They took away visually from the pork and tasted more like paste than celeriac. The tomato confit was very good, and was sitting on top of some more celeriac purée - this time with great celeriac flavor. Decent dessert, but not much tomato flavor that I could discern. The tomato custard was just sweet and the tomato caramel tasted mostly like caramel. There was a dusting of tomato/chocolate "dirt" that was interesting, but still mostly just tasted like chocolate. Overall, a fairly enjoyable, but somewhat lacking meal. Less experimental than I was expecting given reviews I had read and not very successful as a tomato tasting menu. Service was fine, but fairly perfunctory and did not show much interest in the food. This was only the second day they had been offering the new tasting menu, though, so perhaps it will improve with time. 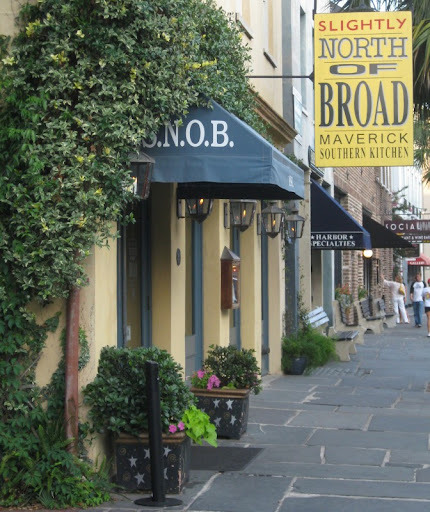 On our second night in Charleston we had dinner at the bar at Slightly North of Broad (S.N.O.B. ), another well-thought-of establishment. We liked the place immediately - it had a really nice, active atmosphere for a Monday night. We had the Charcuterie Plate and the Carolina Quail Breast. The quail was fantastic - it had a really nice, "grilly" taste to it and the meat was perfectly cooked. It was served on a dollop of cheese grits that were different than most that we've had - more grainy and less creamy. We liked them a lot. The house-made charcuterie was a steal - great, generous assortment. The contents of the plate vary, but this time it was country paté, pork rillettes, head cheese, ham and chicken liver mousse. The head cheese was particularly interesting - very different than we've had before. It reminded me more of a slice through the jowel than the normal conglomation of pig face bits. So, two very enjoyable dishes. If we ever return to Charleston, we will definitely go back and sample some more.